The airport has a diverse international history and has been known by a variety of names. It was originally built in 1923 as an Italian air force base called aeroporto militare di Mellaha. It became a German air base during World War II. The airbase was captured by the British 8th Army in January 1943 and transferred to the control of the US Army Air Forces, who called it Mellaha AAF until 1945, when they renamed it Wheelus Air Base for a US airman killed that year. American use continued until the 1969 Libyan coup d'état. The Americans were expelled and the base was renamed Okba Ben Nafi Air Base (قاعدة عقبة بن نافع الجوية) after the Islamic general who conquered north Africa. It was used by both Libyan and Soviet air forces. The United States bombed the base in 1986 during Operation El Dorado Canyon. In 1995, the air base was converted to a second civilian airport for Tripoli, and was given its current name. The airport was originally built in 1923 by the Italian Air Force as Mellaha Air Base (الملاّحة). A motor racing circuit subsequently built around the airport and Mellaha Lake began hosting the popular Tripoli Grand Prix in 1933. Mellaha was used by the German Luftwaffe during the North African Campaign, with the Germans using it for short range recon units, as well as coastal and naval recon units. Special weather recon units also existed at Mehalla. The main Luftwaffe unit stationed at the base was the 2nd Staffel of the Aufklärungsgruppe (H) 14 or 2.(H)/14. The squadron was equipped with twelve single-engined Henschel Hs 126, an aircraft with 2-man crews, which could cover approx 710 km, with a maximum speed of 360 km/h, as well as three Fieseler Fi 156 Storch liaison aircraft, and a Junkers Ju 52 for transport of men and materiel. The airbase was captured by the British 8th Army in January 1943. The US Army Air Force began using Mellaha as a base in January 1943. It was used by the 376th Bombardment Group (Heavy) of the 12th Air Force for B-24 bomb missions into Italy and southern parts of Germany. In addition, Mellaha Field was used by Air Transport Command. It functioned as a stopover en route to Benina Airport near Benghazi or to Tunis Airport, Tunisia on the North African Cairo-Dakar transport route for cargo, transiting aircraft and personnel. On 15 April 1945 Mellaha AAF was taken over by USAAF's Air Training Command. It was renamed Wheelus Army Air Field (AAF) on 17 May 1945 in honor of USAAF Lieutenant Richard Wheelus who had died earlier that year in a plane crash in Iran. After the US Air Force left in 1970, the base was renamed Okba Ben Nafi Air Base (seemingly after the legendary hero Uqba ibn Nafi) and served as a Libyan People's Air Force (LPAF) installation. OBN AB housed the LPAF's headquarters and a large share of its major training facilities. In addition, aircraft and personnel of the Soviet Air Force took up residence at the base. LPAF Soviet-made MiG-17/19/25 fighters and Tu-22 bombers were based at Okba Ben Nafi Air Base. Of the combat aircraft, the US State Department estimated in 1983 that fifty percent remained in storage, including most of the MiG fighters and Tu-22 bombers. Ilyushin Il-76 targeted in the bombing of 1986. In 1986, the base was a primary target of Operation El Dorado Canyon, a US retaliatory air strike against Libya for missile attacks on US aircraft over disputed territorial waters in the Mediterranean Sea and Libyan involvement in terrorist attacks on US servicemen in Europe. At 2 a.m. on 16 April 1986, Okba Ben Nafi AB, various Libyan government buildings, and three of thirty alleged Libyan terrorist training camps were bombed by F-111Fs from the USAFE's 48th Tactical Fighter Wing, flying non-stop from RAF Lakenheath, United Kingdom, to Libya. Operation El Dorado Canyon included eighteen 48 TFW F-111F "Aardvark" fighter-bombers (Pave Tack-equipped), five EF-111A "Sparkvarks" from the 66th Electronic Combat Wing/42nd Electronic Combat Squadron at RAF Upper Heyford, UK, and carrier-based US Navy F-14 Tomcats and A-6E Intruders. The 66 ECW Sparkvarks formed up with the attack force to provide electronic defense during the attack. One 48 TFW F-111F was lost outbound from the attack to (presumably) a SAM or AAA hit. The 48 TFW had practiced for years at Wheelus with F-100s and later at Zaragoza AB Spain with F-4D Phantoms and the F-111s for just such a mission. Okba Ben Nafi AB was converted for civilian use and became Mitiga Airport in 1995. The airport also housed the headquarters of Buraq Air. During the 2011 Libyan civil war, the Times of Malta and The Guardian reported claims that the airport had been taken over by protesters opposed to Libyan leader Muammar Gaddafi. On 13 March 2011, Ali Atiyya, a colonel of the Libyan Air Force at the airport, defected and joined the anti-Gaddafi forces. 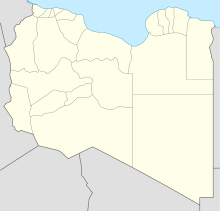 On 21 August 2011, rebels launched an assault on Mitiga as part of a bid to battle loyalist forces in Tripoli, sustaining a number of casualties in the process. On 25 October 2011 Google Earth released multispectral imagery from GeoEye taken on 28 August 2011 which showed the airfield as well as the highly capable MiG-25 aircraft without any visible damage. This imagery confirmation helps validate the reporting which suggests the airfield had been taken over early on by opposition protesters as NATO and US air forces would want to avoid collateral damage to the opposition movement. During the 2019 Western Libya offensive, the airport, held by military units loyal to the Government of National Accord, was repeatedly targeted with airstrikes from the opposing Libyan National Army in order to enforce a no-fly zone declared by the LNA several days prior. On 23 December 2016, Afriqiyah Airways Flight 209 from Sabha Airport to Mitiga International Airport, operated by an Airbus A320-214, registration 5A-ONB was hijacked and diverted to Malta International Airport. ^ "Libyan authorities close only functioning Tripoli airport after air strike - official". Ynetnews. Retrieved Apr 10, 2019. ^ "Tripoli's sole functioning airport bombed by fighter jets". The National. Retrieved Apr 10, 2019. ^ Liesemeijer, Herman. "Tripoli - Circuits of the past". www.circuitsofthepast.nl. ^ "Wheelus Air Base". Atlas Obscura. ^ Flashback: The Berlin disco bombing. BBC on 13 November 2001. ^ "Here Mittiga base where Gaddafi celebrates 40 years of resistance". Il Foglio. 17 June 2011. ^ "Company Profile." Buraq Air. Retrieved 14 May 2010. "The company headquarters are located at Mittiga International Airport in Tripoli – Libya." ^ "Fresh reports of Tripoli fighting - air base may have fallen to rebels". Times of Malta. 25 February 2011. Retrieved 25 February 2011. ^ "Libya in turmoil - Friday 25 February". The Guardian. 25 February 2011. Retrieved 25 February 2011. ^ "BREAKING: Body of Al Jazeera Cameraman Ali Al Jabir arrives in Doha | Libya February 17th – Archive site". archive.libyafeb17.com. Retrieved 2018-08-21. ^ Heavens, Andrew, ed. (20 August 2011). "Libyan rebels in fight for Tripoli airbase-activist". Reuters. Retrieved 3 September 2011. ^ "After Action Report: Umm Aitiqah Airfield, Libya". OSGEOINT. 28 October 2011. ^ عربية-الآن, سكاي نيوز (2019-04-08). "طائرات الجيش الوطني الليبي تشن 3 غارات على مطار معيتيقة وسط طرابلس". @SkyNewsArabia_B (in Arabic). Retrieved 2019-04-08. ^ "Haftar forces announce no-fly zone after being targeted by air strike". english.alarabiya.net. Retrieved 2019-04-08. ^ "Afriqiyah Airways | Hahn Air Lines". www.hahnair.com. Retrieved Apr 10, 2019. ^ "Booking a Flight". Buraq.aero. ^ "5A-ONB Hijacking description". Aviation Safety Network. Retrieved 23 December 2016. Airport information for HLLM at World Aero Data. Data current as of October 2006.